Center for Tourism Research (CTR), Wakayama University, holds Seminar Series ‘Tourism and SDGs’ throughout 2018 under our mission; contribute to the development of a sound and sustainable society through the advancement of tourism research. Dr. Abhik Chakraborty will present his research projects in North Japan Alps and Shiretoko Peninsula and reflect on ecotourism, conservation, and sustainable development goals. *No registration, no registration fee required. 'Anthropocene' is a term that denotes the sweeping changes made to the planet's ecosystems and natural processes due to human activities in the past 100 years. This is also a concept that forces us to rethink how to manage natural heritage in the 21st century; for example, it is no longer sufficient to see nature as 'abundant' or a 'highly valuable resource', and it becomes imperative to understand the current condition of anthropogenic change and impact of tourism in fragile environments. Ecotourism is often seen as a tool to aid conservation and restoration of damaged environments, and therefore it is important that ecotourism is planned and implemented based on ground realities. 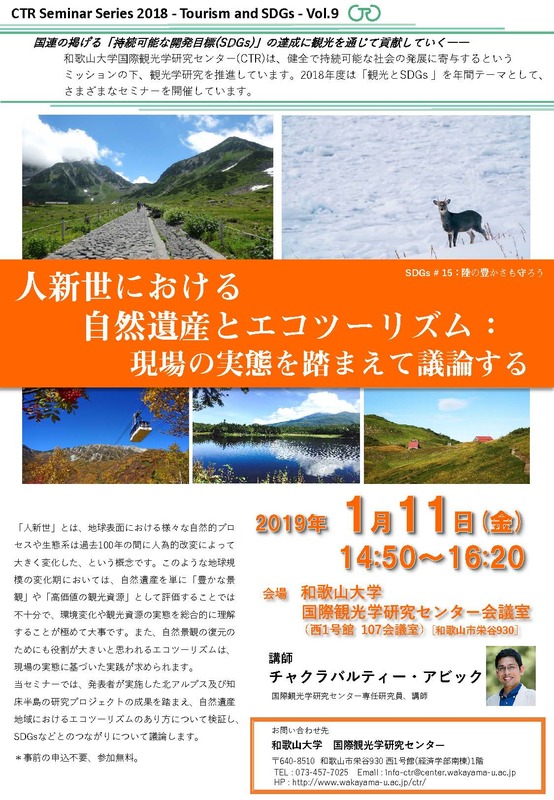 In this seminar, I will introduce my research projects in North Japan Alps and Shiretoko Peninsula and reflect on ecotourism, conservation, and sustainable development goals. E-mail： *Click here to the Contact page.